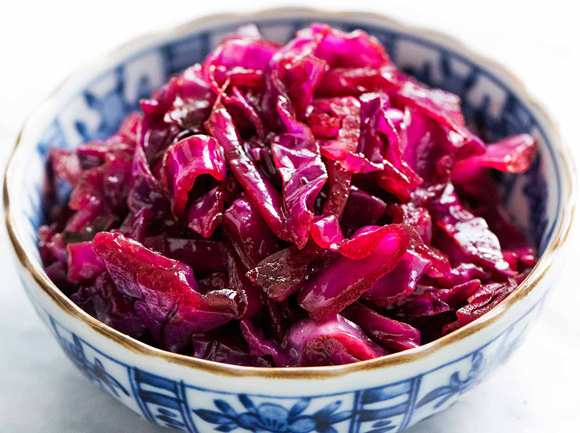 Who knew Red Cabbage and beets went together so well. Melt the margarine in a small saucepan over medium heat. Add sugar, red pepper, black pepper, and cinnamon; cook 30 seconds, stirring constantly. Remove from heat; stir in pecans. Spread pecan mixture onto a baking sheet coated with cooking spray. Bake at 325° for 8 minutes; cool. Set aside. In a Dutch oven or large heavy pot cook bacon until crisp. Remove crumble and set aside. Remove all but one tablespoon of the rendered bacon fat. Add the sliced shallots and cook until soft about 6 minutes. 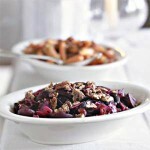 Add the currant Jelly and wine vinegar, salt and, pepper ground cloves, red cabbage and beets to the pot. Bring to a boil. Reduce Heat to low cover and simmer until tender about 50 minutes. Stirring occasionally. When cooked add bacon and cook for another 5 minutes. Serve with a topping of the roasted nuts. I just use a Packaged pepper toasted nut like Schale’s Snackes which you can find at Walmart. Very similar to the above recipe. So good! It’s wonderful served alongside pork chops, pork roast or Ham. 2 apples (granny smith) cored, peeled and sliced into ¼ inch slices. 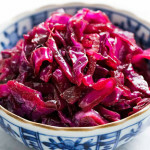 Microwave cabbage with oil and ½ teaspoon salt in bowl, stirring occasionally, until softened, 15 to 20 minutes. Drain cabbage and discard liquid; transfer to slow cooker. Cook bacon in 12-inch skillet over medium-high heat until crisp, about 5 minutes. Add onion, thyme sprigs, cinnamon stick, caraway seeds, and allspice and cook until onion is softened and lightly browned, 8 to 10 minutes. Stir in ½ cup cider, scraping up any browned bits; transfer to slow cooker. Stir remaining cup cider, 1 tablespoon sugar, and bay leaves, and apple into slow cooker. Cover and cook until cabbage is tender, 4 to 6 hours on low. 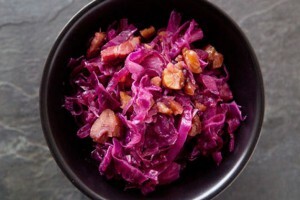 The slow cooker, with its moist heat environment, is perfect for braising cabbage. However, adding the cabbage directly to the slow cooker left it too crunchy for our liking. To get the texture just right, we had to precook it in the microwave to soften it slightly. This step had the added benefit of getting rid of excess moisture that was otherwise detracting from the flavors of the dish. For the braising we selected sweet and fruity apple cider, enhancing it with traditional spices such as cinnamon, caraway seeds, and allspice. A bit of sugar rounded out the sweetness while vinegar perked up the flavors and added balance. 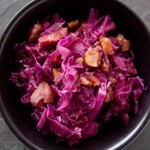 Since tasters found the cabbage a little lean, we added bacon, which imparted a smoky depth and richness.